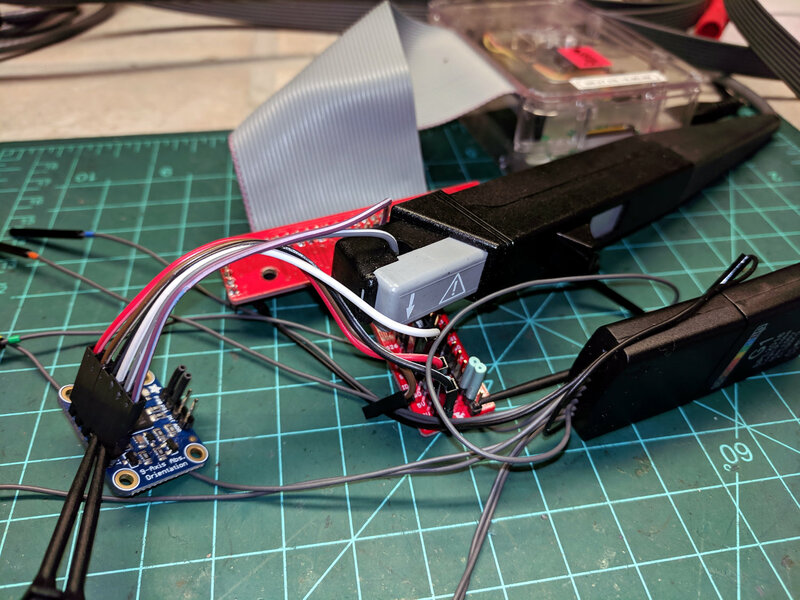 The arrow on the probe points toward the Pi, so (conventional) current flowing through the 10 kΩ pulldown resistors into the Pi will be positive and current flowing from the Pi into the BNO055 will be negative. The 0 mA baseline isn’t exactly at zero, because the AM502 amp has thermal drift like you wouldn’t believe, particularly with the gain cranked to 1 mA/div. 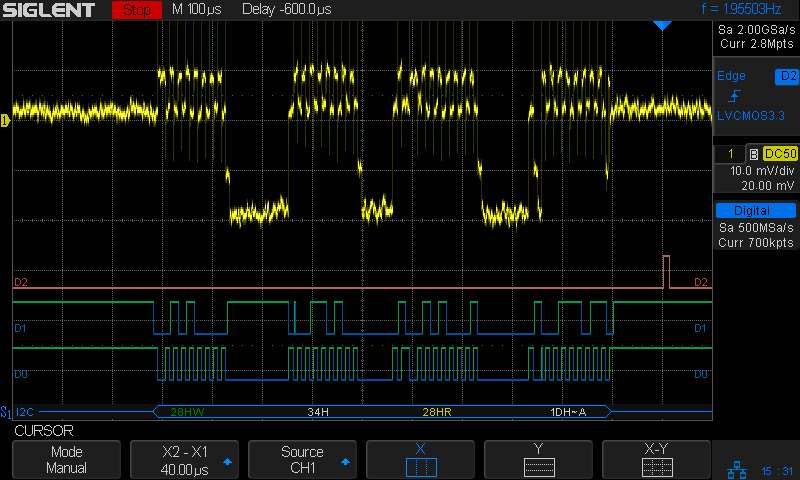 The probe + amp calibration seems slightly bogus: a 3.3 V supply pulled to ground at the Pi through the 10 kΩ resistor on the BNO055 breakout should deliver 0.33 mA, not nearly 1 mA. It’s close enough for now; I should cook up a probe calibration fixture. The BNO055 sinks about 2 mA, which suggests a 1.6 kΩ pullup to 3.3 V on the Pi. Although you’re supposed to have one pullup on the I2C bus lines, some casual searching with the obvious keywords shows the Pi has 1.8 kΩ resistors on board. So Adafruit’s advice to add 2.2 or 3.3 kΩ pullups at the BNO055 (admittedly, for a Beaglebone, not a Pi, but I suspect some folks miss such details) lowers the parallel resistance to about 1 kΩ, just about as low as you should go. It is not obvious to me that reducing the resistance by a factor of two will change the bus timing by enough to rescue a marginal situation (stipulated: the Pi is beyond marginal). TI has a useful App Note on the subject of I2C pull up resistance calculations. Anyhow, I now have a way to examine the Pi’s clock stretching bugginess in grim detail, which is the point of this exercise. Note that the hardware bug has remained un-fixed (probably tagged WONTFIX) in all Pi silicon versions, including the Pi 3 as of 2018.